Pope Francis washes the feet of inmates during his visit to the Regina Coeli detention center in Rome, March 29, 2018. During his Holy Thursday visit, Francis stressed that a pope must serve society's marginalized and give them hope. Pope Francis told inmates of a central Rome prison Thursday that a leader must know how to serve. 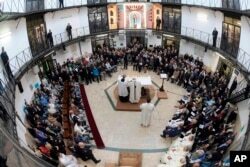 Just before washing their feet on Holy Thursday at Regina Coeli, just a stone's throw away from the Vatican, the pope also told the inmates that he was a sinner, just as they were, but he represented Jesus. Francis washed the feet of 12 inmates in the same way that Jesus washed the feet of his 12 disciples before sharing the Last Supper with them. The men, selected by prison authorities, were from Italy, the Philippines, Morocco, the Moldavia region, Colombia, Nigeria and Sierra Leone. Eight of them were Catholics, two Muslims, one Buddhist and one Orthodox Christian. The visit by Francis to the city's oldest and best-known prison evoked memories of December 26, 1958, when Pope John XXIII became the first pontiff to call on Regina Coeli. Since the start of his pontificate five years ago, Francis has celebrated the Mass of Our Lord's Supper on Holy Thursday outside the Vatican. In the past, he has gone to detention centers and a home for the disabled to wash the feet of prisoners, refugees and other marginalized people. This is a tradition that Francis began as archbishop of Buenos Aires, where he would regularly mark the Holy Thursday liturgy in local jails. Pope Francis leads a Mass during his visit to the Regina Coeli detention center in Rome, March 29, 2018. At the prison, the pope also greeted inmates and visited those who were sick inside the prison's infirmary. In the morning, the pope celebrated the traditional Chrism Mass in Saint Peter's Basilica. As Holy Thursday was the day Jesus shared his priesthood with the apostles, Francis led the many priests, bishops and cardinals present in a renewal of their priestly vows. The pope also blessed the oils that will be used in the sacraments of baptism, confirmation, ordination and the anointing of the sick throughout the year. In a lengthy homily, Francis urged priests to be close to their people, calling proximity "the key to mercy" and truth. Jesus, the pope said, could have been a scribe or a doctor of the law, but he wanted to be an "evangelizer," a street preacher, the "bearer of joyful news" for his people. The pope told priests all over the world: "Closeness is crucial for an evangelizer because it is a key attitude in the Gospel." On Good Friday, Francis will preside over the Way of the Cross procession at Rome's ancient Colosseum, re-enacting Christ's crucifixion.